I’d just discovered that stitching a quarter inch seam on a sewing machine was not a difficult as I had thought. 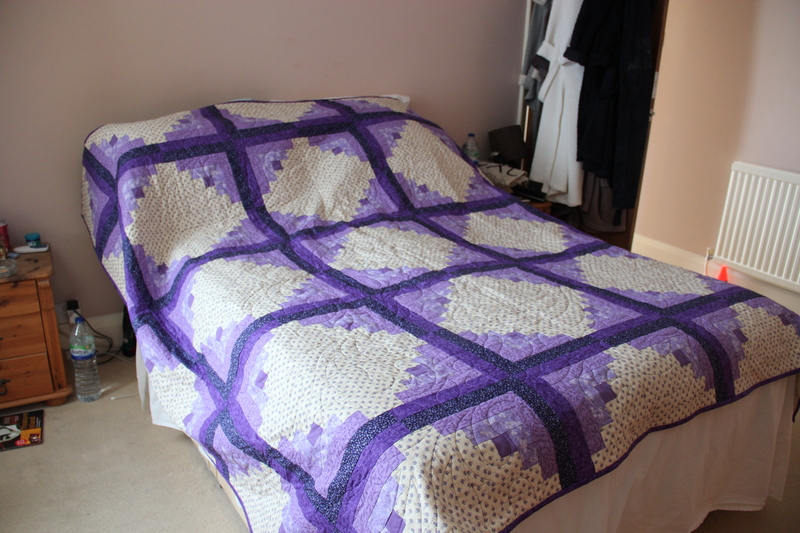 For years I had put off using my machine to make quilts, clothing yes, but quilts were a no go area. With a brown and cream scrap Log Cabin under my belt I decided to delve into the stash – nearly disappeared without trace as I did so – and make a red and cream scrap version. Having surfaced with a veritable treasure trove of long forgotten ‘friends’ I proceeded to sort them into lights (red print on cream) and darks (solid reds) and washed each pile separately. I have a passionate hatred of ironing. Clothing seems to multiply of its own accord while waiting in the basket to be flattened. 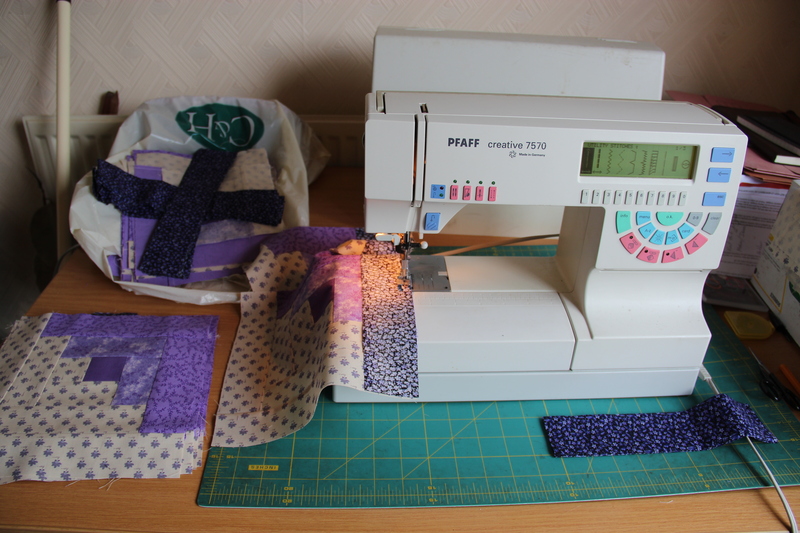 Quilting fabric on the other hand ……… that’s therapeutic ironing because your mind can drift and plan exactly what you are gong to do with your treasures. And so began the conversion from fabric scraps to quilt top. I cut the strips and put them in neat piles. Then the sewing commenced: a scarlet centre surround by light and dark strips. In each block all strips were different. I wanted a really scrappy look but co-ordinated at the same time. Soon the blocks were completed and it was time to clear the lounge floor and lay them out, this being the only room with enough floor space to lay a full size bed quilt out. I stood back to get the overall view, rearranged a few and looked again. Satisfied with what I saw I began piecing the blocks together row by row. It was then that I noticed my four cats outside. The younger two were quite happy chasing bugs across the lawn and the old boy was curled up asleep but the old lady, Missy, was looking very grim and pawed the door occasionally to get in. Not a chance! They were not allowed in the sewing room so there was no chance of them getting into the lounge while my precious sewing was all over the floor. I ignored the felines and continued piecing the top together. 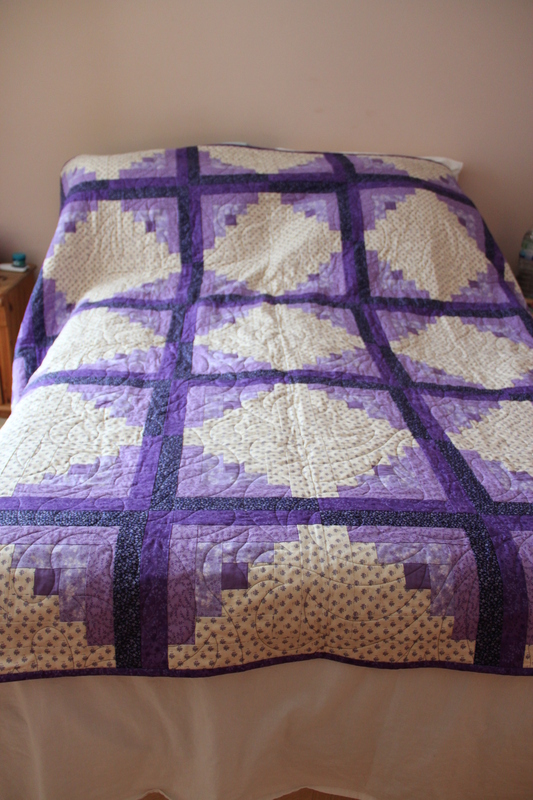 I was just pinning the last long row of blocks together to complete half the quilt when there was something the resembled a black whirl wind hurtling through the door, like lightening it was across the floor, over the arm of the chair in which I was sitting and landed on my lap, right on top of the pieced half of the quilt. Missy! What happened next beggars belief, she relieved herself on my lap! I flew out of the chair as the dampness spread. The cat went flying and hid as I shrieked at her. 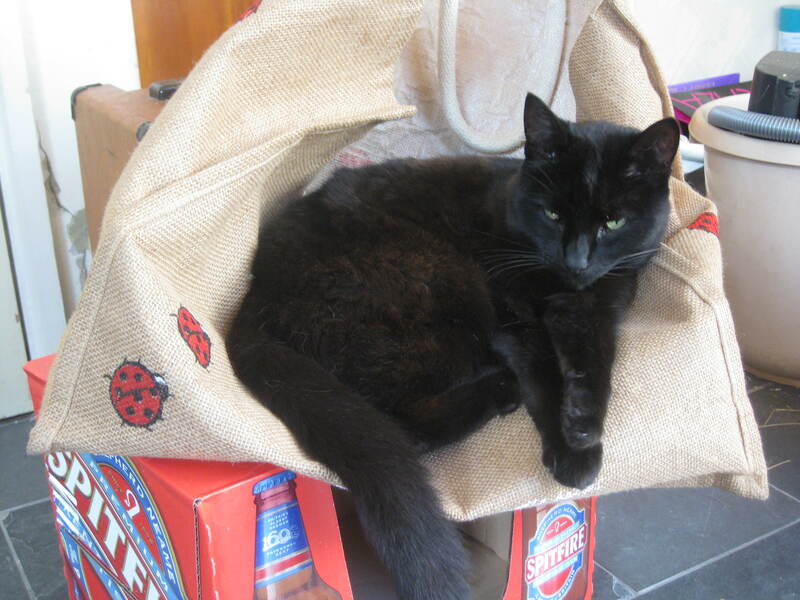 What do you do with a quilt, no, half a quilt, covered in cat pee? There was nothing for it other than the washing machine and, as soon as possible before the offending liquid dried and left a stain. In it went, warmer wash than usual with liquid soap used for delicates. I had nothing to lose. I have never known 38 minutes go so slowly. 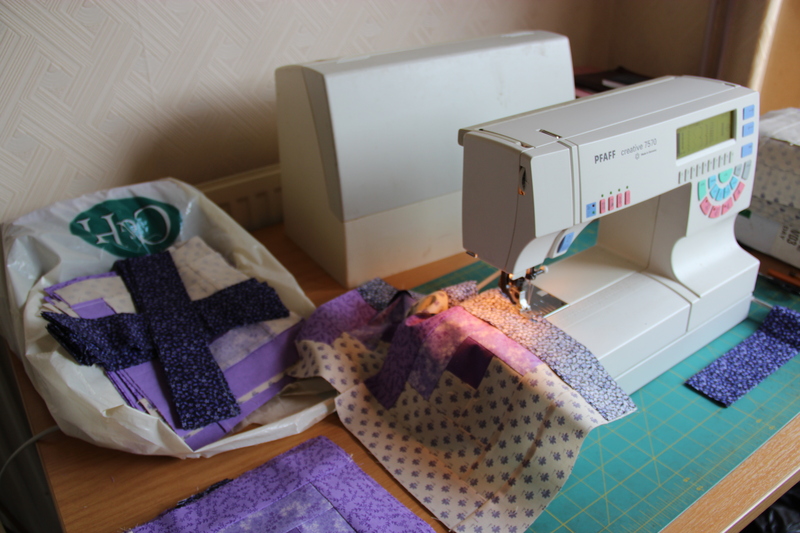 Eventually the cycle ceased, the machine bleeped and I withdrew the quilt half. Horror of horrors, the red had run (so much for prewashing) but not as one would expect. 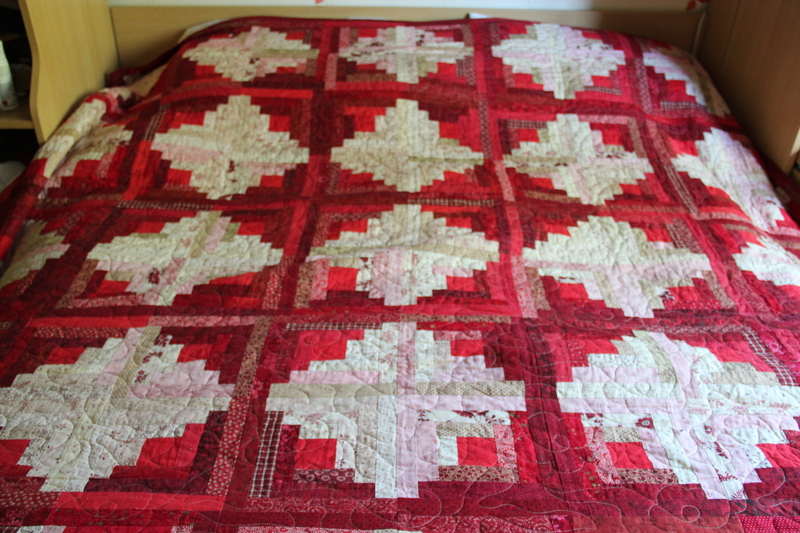 Some of what were cream and red pieces were now pink and red and, fortunately, they were randomly scattered over the quilt. Maybe it wasn’t such a disaster after all. I hung it out to dry and went in for a cup of tea while I considered what to do about the unfinished half. As I saw it there were two choices. One, make a single bed quilt of the cream, pink and red half or two, make up the second half, wash it the same way and hope that it wasn’t the cat pee that caused the dye to run. There was also a thought that maybe the fabrics had shrunk so it was essential that the second half be washed if I wanted to join the two together. Back at the sewing machine I beavered away to complete the second half then, with some trepidation, I stuffed it into the washing machine on the same settings and with the same amount of soap. I pushed the button and left it. When it had finished I peered through the glass and thought I saw pink. I did! Eureka moment! Exactly the same thing had happened. I dried this part in the same way. I have to say that there is nothing therapeutic about ironing a wrinkled quilt top when there are lots of seams involved and, because of the washing, a lot of frayed edges from which the loose threads had to be removed. Missy was cursed several times during this process. Eventually both pieces were flat, loose ends were a thing of the past and I joined the halves together without hindrance. 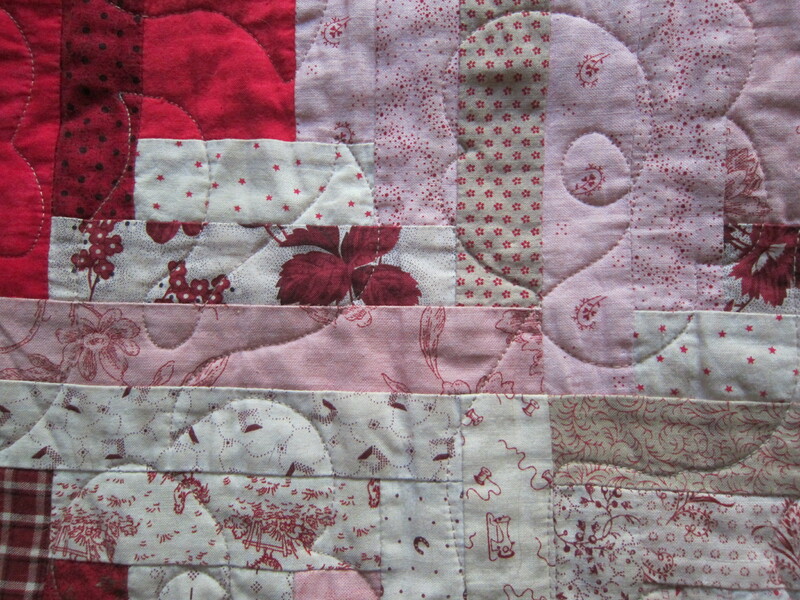 The resulting quilt top was very pleasing and I’m sure I could not have achieved the arrangement of pink and cream pieces if I had tried. 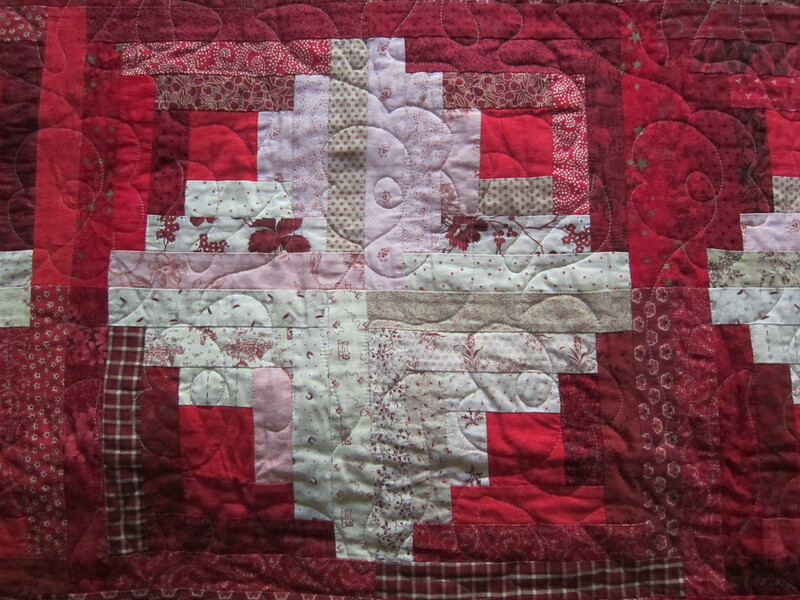 I have to thank Susie Green for machine quilting this piece for me, she really put the icing on the cake. When I dropped the top off to her I noticed that she also banned her cat from her studio. 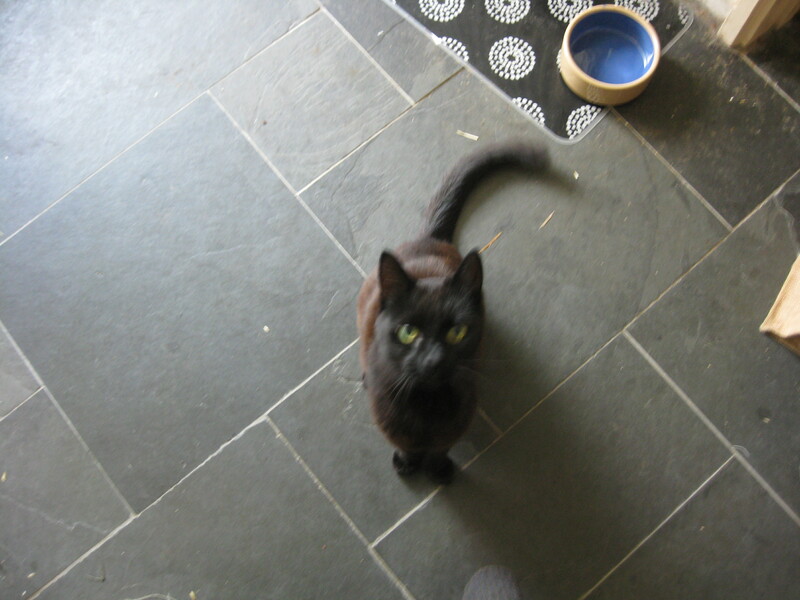 To this day I have no idea how Missy got back into the house …. I was sure I shut all the windows and doors …. But who knows? She is a black cat.